Francis Harry Compton Crick, a British biophysicist, was co-winner of the Nobel Prize in physiology and medicine in 1962, for his work in genetics. This award was shared with American biologist James D. Watson and British biophysicist Maurice Wilkins. 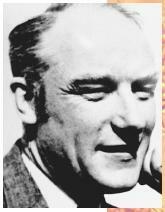 Francis Crick, the son of a local shoe factory owner, was born on June 8, 1916, in Northampton England. He did his undergraduate work at University College, London, where he studied physics. Crick's science education was interrupted by World War II. After the war, in 1946, Crick's interest in chemical research was awakened after he attended a lecture given by American chemist Linus Pauling. Crick remained fascinated with organic molecules, and with quantum mechanics and the chemistry of genetics. Crick went on to conduct research at the Cambridge Medical Research Council Unit at the famous Cavendish physics laboratory. He received his doctorate in 1953 from Cambridge University during the beginning of his collaboration with American biologist James Watson. In 1952, at Cambridge, Crick and James Watson began to investigate the molecular structure, and significance to genetics, of nucleic acids. They began by looking specifically at earlier X-ray diffraction analyses of deoxyribonucleic acid (DNA), by Maurice Wilkins. DNA was already then considered to be the substance of which genes were made. Watson and Crick used Wilkins's data, part of which came from coworker Rosalind Franklin, to create a three-dimensional model of the DNA molecule. The model included known facts, such as the chemical constituents (nitrogen bases, sugar, and phosphate), and took into account data from Wilkins's X-ray diffraction experiments. Watson and Crick tried out various ways of arranging model molecules in space, finally settling on the aptly named double helix. Their model, afterwards referred to as the Watson-Crick model, showed DNA as a twostranded twisted "helix." The two strands contain complementary nitrogen bases. This model both matched chemical facts previously known about DNA, and provided a viable explanation for how DNA could replicate, and thus for how genetic information could pass from one generation to the next generation of living organisms. Crick's discoveries revolutionized biology. After the acceptance of the Watson-Crick model, biologists could begin to understand living things at the molecular level. Living organisms could be related to one another according to their genetic similarities and dissimilarities. Following the elucidation of the structure of DNA, Crick turned his attention to how genetic information is stored and used in a cell, and formulated the "central dogma" of molecular biology: that DNA dictates the sequence of ribonucleic acid (RNA), which dictates the sequence of amino acids in proteins , without the possibility of a reverse flow of information. He continued to make important theoretical contributions to genetics with a particular interest in development, until he turned his attention to neuroscience in the late 1970s. Crick's focus since then has been on the biology of consciousness and the nature of visual processing in the brain. Among Crick's well-known publications are Of Molecules and Men (1996) and Life Itself (1982). Crick, Francis. What Mad Pursuit? New York: Basic Books, 1988. Sherborn, Victoria. James Watson and Francis Crick: Decoding the Secrets of DNA. Woodbridge, CT: Blackbirch Press, 1995. Strathern, Paul. The Big Idea: Crick, Watson, and DNA. New York: Anchor, 1997. Watson, James. The Double Helix. New York: Norton Press, 1968.